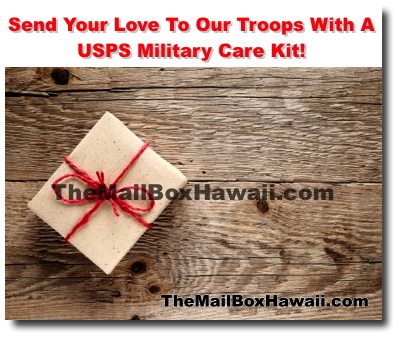 Send Your Love To Our Troops With A USPS Military Care Kit! There's no better time than the present to send a piece of home to a loved one serving in the military. With the United States Postal Service's Military Care Kit, you can send presents and care packages more easily! 2 Priority Mail APO/FPO/DPO flat rate boxes. 2 Priority Mail Medium flat rate boxes. To order the kit, call 800-610-8734 or visit USPS.com. When addressing the package, be sure to write out the service member's full name in the address and to include the unit and APO/FPO/DPO address with the 9-digit ZIP Code (if assigned). However, as a precaution, do not write the country where the service member is stationed in the address and include a return address. Lastly, make sure to also include the service member's name and address as and your name and address on an index card inside the package, just in case the shipping label gets damaged in transit. For related tips, read our Mailing Tips for Army, Fleet or Diplomatic (APO/FPO/DPO) Shipments.